Equity trading is the perfect example of the “high-risk, high-return” scenario. 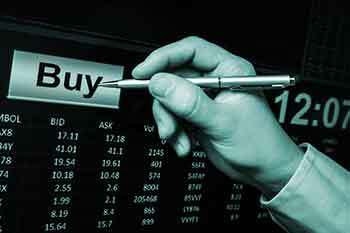 One of the most sought-after options of making money in the share market is equity trading. It is the process of buying and selling shares of a company. The shares are purchased and sold through a stock exchange, such as the NSE or the BSE. By purchasing the shares of a company, the investor becomes a part owner of the company. He is now called a shareholder and enjoys a part of the future profits the company makes. Equity trading is the perfect example of the “high-risk, high-return” scenario. This means that the higher the risk, the higher the potential gain. It requires holding the shares of a company for an extended period and gaining from the consistently profitable performance of the company. 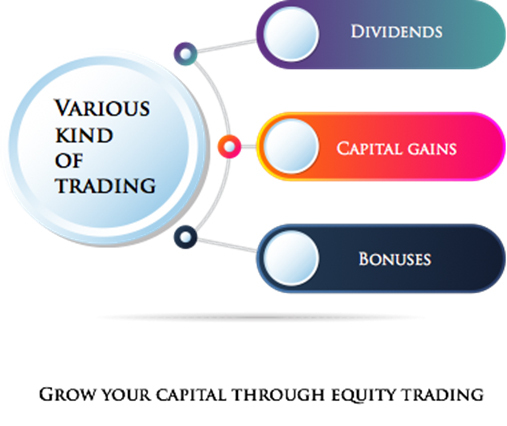 How can you grow your capital through equity trading? Once an investor has invested money in the company, he/she is entitled to a part of the company's profits. A dividend is an amount of money which is regularly paid to shareholders out of company profits. As long as the investor retains his shares, he/she will be entitled to receive regular dividends from the company. If a company's stock price goes up on the back of successful performance, the investor can sell the shares of the company and earn money from the transaction. For example, if you bought 1,000 shares of a company at Rs500/share, and the price went up to Rs750/ per share, you could sell them at this higher value, thus, making a profit of Rs2,50,000. This profit is called capital gains. If the company is doing tremendously well and is making higher-than-expected profits, it can declare bonuses for its shareholders in the form of cash or free shares. These additional shares can prove to be really profitable for the shareholder. Apart from the methods which can help investors grow their capital, there are certain “equity trading tips”, which you should keep in mind when dealing with stocks. Along with being highly profitable, equity trading is equally susceptible to losses. In such a scenario, a stop loss can prove to be a handy tool for lowering the risk of the aforementioned losses. Stop loss helps an investor sell a stock when it slides to a price which is lower than the stop loss trigger price. For example, if you bought the shares of company A at Rs100 and set a stop loss at Rs90, the shares would be automatically sold off if the price falls to Rs90. This means that you limited your loss per share at Rs10 without having to worry about the price fluctuations regularly. Researching the company’s background and its long-term and short-term earnings is the foremost thing that an investor should do before investing. Blindly investing in a company is one of the main reasons for massive capital losses. This can be avoided by doing a thorough research of the company you wish to invest in. The great Warren Buffett once said, “Be fearful when others are greedy, and be greedy when others are fearful.” Investing just because everyone else is investing in a particular company is more likely to backfire in the long run. The company can look to be profitable from the outside, but its internal structure can collapse in the long term, thus, negatively affecting your capital growth. You have to understand that the market is volatile and dynamic and that it has its ups and downs. A disciplined approach is what is essential when trading in equities. If the market is not doing well, do not panic and sell your shares in a hurry thinking that you are doing the right thing. Similarly, if the market is doing well, do not be greedy and sell your shares in the pursuit of making money before studying the trend carefully, as you may miss out if the share keeps on climbing further.